Algorithmic developers are receiving some positive news today as Spotware Systems, operators of the cTrader platform, have announced integration with Microsoft’s Visual Studio. With the integration, users of cTrader’s algorithmic trading system will be able to develop C# based strategies using the Visual Studio environment. 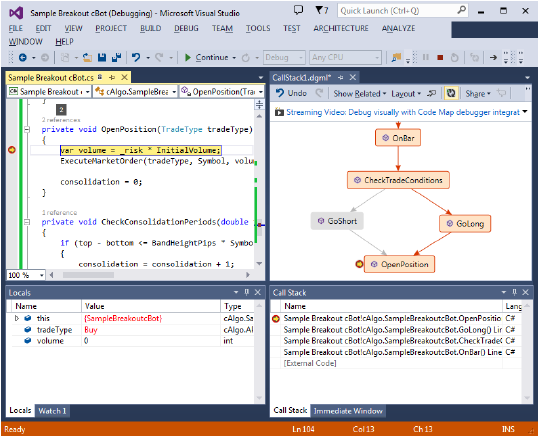 For developers, integration with Visual Studio means the ability to access time saving components of the compiler, such as code snippets and IntelliSense, as well as the platform’s debugging tools. Speaking to Spotware Systems about the usage of their cAlgo system in tandem with cTrader, Ilya Holeu, Head of Sales at the technology provider, stated to Forex Magnates, “It differs from broker to broker in the range of 0-30%.” In addition to the development of algorithmic trading strategies, cAlgo can also be used for the creation of customized technical analysis indicators. Similar to Ninjatrader, Spotware made the decision to operate its development environment using the popular C# programming language as opposed to producing a proprietary language like MetaQuotes’ MQL The advantage of C# is that it provides programmers the opportunity to develop in a language many are familiar with.